My edition: Paperback, published on 28 August 2014 by Quercus, 432 pages. Description: Alison is a marriage mender. Her job is to help couples who fear they have reached the end of the line. But the trouble with spending your time sorting out other people's problems is that you tend to take your eye off your own. Even when her husband's ex Lydia arrives on the doorstep demanding to see her son, Alison thinks she can handle it. But what Alison doesn't realise is that Lydia is the one person who has the ability to destroy their happy family. And sometimes the cracks can run so deep that even a marriage mender can't repair them. Alison is a marriage counsellor, so you'd assume she knows what it takes to create a stable relationship. But when at the start of the novel she and her husband Chris start to go to therapy to mend their struggling marriage, questions instantly arise. What has happened for them to get to this desperate final attempt to prevent a divorce? And is there any point at all in trying to fix what has been broken? After that first chapter the clock rewinds and we become acquainted with the Bentley family before everything started to fall apart. They seem to be blissfully happy together and are raising two great kids; Josh, Chris' son from a previous relationship, and Matilda. Josh may not be Ali's biological son, but she has been taking care of him since he was just a little boy and for all intents and purposes she is his mother. So when on Josh' sixteenth birthday his biological mother suddenly makes an appearance, it immediately throws their carefree lives into tumult. And it's not a one-time disruption either; her visit sets into motion the unravelling of secrets so powerful that their loving family unit is rapidly pulled apart. Alison, always aiming to please everyone around her, is desperate to keep her family together, but is she fighting a losing battle? I've been anticipating this book ever since I first heard about it as I found Linda Green's previous novel, The Mummyfesto, hugely inspirational (read my full review here) and I was excited to read more by her hand. The Marriage Mender was a very different kind of story but not any less excellent. Gripping from the moment I started reading, I was unable to stop reading this compelling read until I had turned the final page. Ali was a wonderful main character and I cared for her deeply. She always had the best interest at heart for those around her, too much so even and I did feel she was being far too nice to Chris' ex. And when her carefree life started to unravel, more than anything I wished for those around her to be supportive as she was hurting just as bad as Chris and Josh, even if it wasn't visible on the surface. Chris on the other frustrated me to no end. While we do find out why he shuts out his family, his self-centred attitude meant that the one person who needed him the most, Ali, was left to figure everything out by herself. My heart went out mostly to Josh though, who was understandably confused by the new revelations in his life and the underlying feeling of loyalty to all those implicated. Just like with Alison, I quickly came to care for him and it was heartbreaking to read about his struggles and the final extreme decision it led him to take. And then there was the sweet Matilda, she was an absolute joy to read about as she brought some much-needed sunshine and cheerfulness into an otherwise tense read. While for the most part this was an excellent novel, I felt that the ending was somewhat rushed. It was over so suddenly, when I wasn't ready yet to let go of these characters. Not to mention that it didn't provide the answers I'd been longing for. Then again, this was foremost the story of Alison and her attempt at getting her family back together and for that it makes perfect sense to finish where it did. 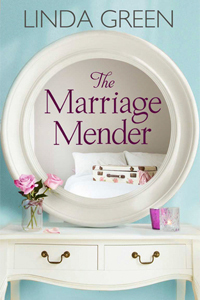 Be prepared for a roller-coaster ride of emotions when reading The Marriage Mender. With a great set of characters and an incredibly intense build up this is an engrossing story from start to finish.